With almost 3 decades of designing and manufacturing volumetric filling lines. 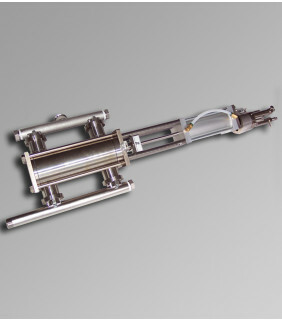 ABA is known for our high quality, fast, and accurate, double acting volumetric piston pumps. As with our 5 gallon models, our one gallon pumps are also positive displacement and double acting piston units. Double acting pumps have product on both sides of the piston chamber which prolongs the life of the product cylinder and seals and allows for greater fill speeds. Our pumps are manufactured with high quality stainless steel parts (elbows, tees, and end caps are cast here in the USA) and Teflon seals and gaskets. 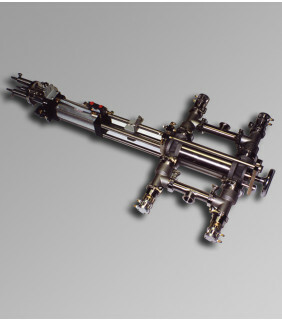 Our pumps are held together with quick release clamps for ease of maintenance and feature a six position selector turret with individual threaded stops to make volume changeover almost instantaneous. The ABA-80-GCV which is supplied with gravity check valves, meaning the liquid in the pump displaces and reseats the check valves itself. Conversely, the ABA-99-PCV is supplied with powered check valves. This means that the air cylinders located on the pump serve to move the check valves on and off their seats. 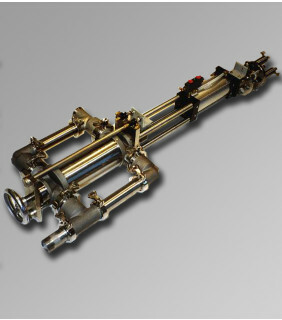 These pumps are best utilized in a setting with high pressure on the supply line. The ABA-P168 is a complete replacement Neumo pump. Depending on the filling technology required by your company, we can find the best volumetric pump for you. Please contact us today for more information about the volumetric piston pumps we offer.